You can keep your child from being bored with some summer homeschooling activities. You could even have activities written on index cards. Place the cards in a basket and have your child pick an activity to do when he says that he is bored. 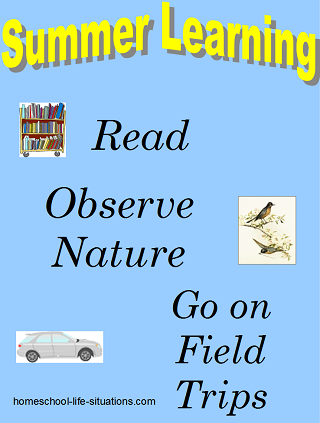 Most of these summer homeschooling activities can be done independently. You will just need to provide the supplies. Color by number some pages have math equations to solve before you know what color to use. Play a board game. Board games can help your child understand math concepts. Go camping and join a Junior Ranger Program. Your child will learn about local plants and animals. Some of the above activities are appropriate for high school students. Here are more ideas to keep your older children motivated and learning. It is a good idea to have some summer homeschooling activities so that your child will continue to learn throughout the summer.